Sketched out a creep hut in the woods for working title Sacnoth. Sketched out some tiles for a caravan of nomads for workingtitle Sacnoth. Looks cool, but the shading is a bit confusing, since you're inverting the colors for some of the carts. Oh, i'm starting to want to really see this come together as a whole! Great sense of mood, i love what you're going for. I have a bit of trouble parsing the depth of the tree trunk. Again, selective use of highlights and shadows might help with that, towards the goal of shaping it into round-ish shape. 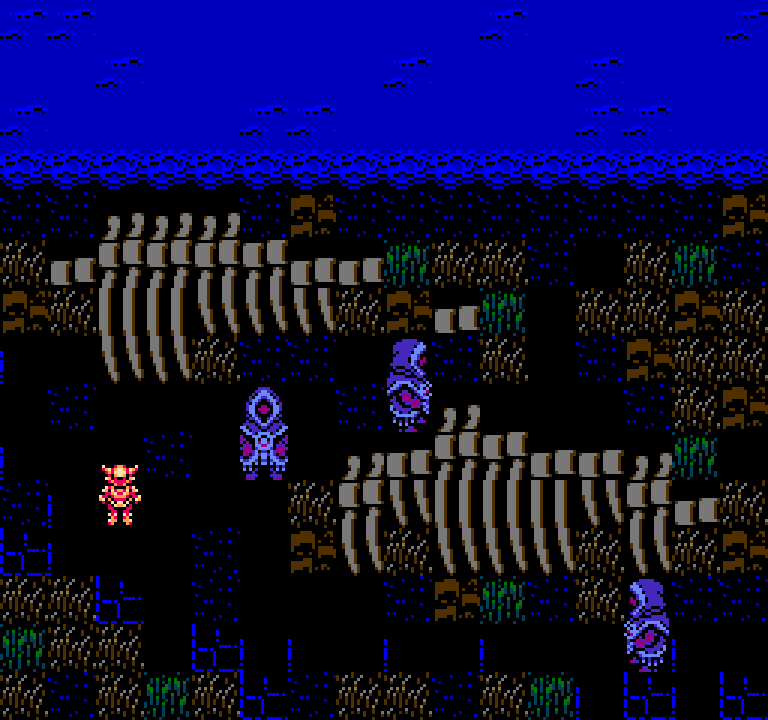 Some tiles (left to the entrance) seem to be a bit out of place/substituting for nonexisting tiles (this is pretty common in NES games, but i think they got me confused here). The carts could use a little bit of highlight on selected edges/surfaces, too, imo. I think the jew highlights looked good on your evil wizard tower, but perhaps they were a little too broadly applied? Ie it sometimes is in places i thought ought to not have as much highlight. Maybe they could be both restricted to places where light would hit, while also being a little bit bolder where they remain? All this is a matter of style and taste, but those are my thoughts. I think the inversion of the carts are to reflect the source of light (the campfire), and it made sense to me. that aside, the fire-facing sides come across as maybe a little flat. edit2 - now that i look at it again, the roof of the rightmost, bottom wagon doens't exactly follow the light direction, which adds a bit of confusion. Might be easy to do differently with one to four more tiles, i think. tokumaru, Thanks for the feedback. What I like about sharing these early sketches is the hearing if what I'm attempting is working or not. I was trying to imply light source with a pallet swap, but it's clear that it's not landing as well as I hoped. Still, that's important for me to know. Cheers! FrankenGraphics, I always really appreciate input from you. I know when I get closer to polishing up these sketching I'm going to go digging back into these threads for your posts. Right now, I feel there is something really special and eerie about pushing for a two color look, but I also don't want that stubborn vision to cause the graphics to become unclear or illegible. Yeah it's easy to recognize that you have a clear ideal and coherent style going on here, which i want to applaud. Also, my apologies for pushing so many suggestions on you that might bend that style out of its intended trajectory. Please let me know if it's too much. Ha! No worries. I've been an artist for too long to be too shaken up about people offering input on my work in good faith. Plus, you are one of the best artists in the scene with a ton more practical experience than me, so I hope you keep the comments coming! Cheers! Oh, I see it now. It still doesn't make much sense to have the top of the frontmost carts lit by the fire. I feel like they should be almost entirely dark cyan. re: the rightmost wagon - the trim/edge of the wagon roof is on one attribute cell (ie. catching the light of the fire), and the roof itself is in another... maybe that's enough? These look great, but thinking as a player, it's not immediately obvious to me what's just background decoration vs what is scenery that causes collisions (ie is the blue splotchy tile just to the bottom right of the player in the caravan picture a collision?) I'm sure I'd learn quickly by playing, but it's not clear to me just by looking. Yeah, I'm a bit nervous about that too, Gauauu. 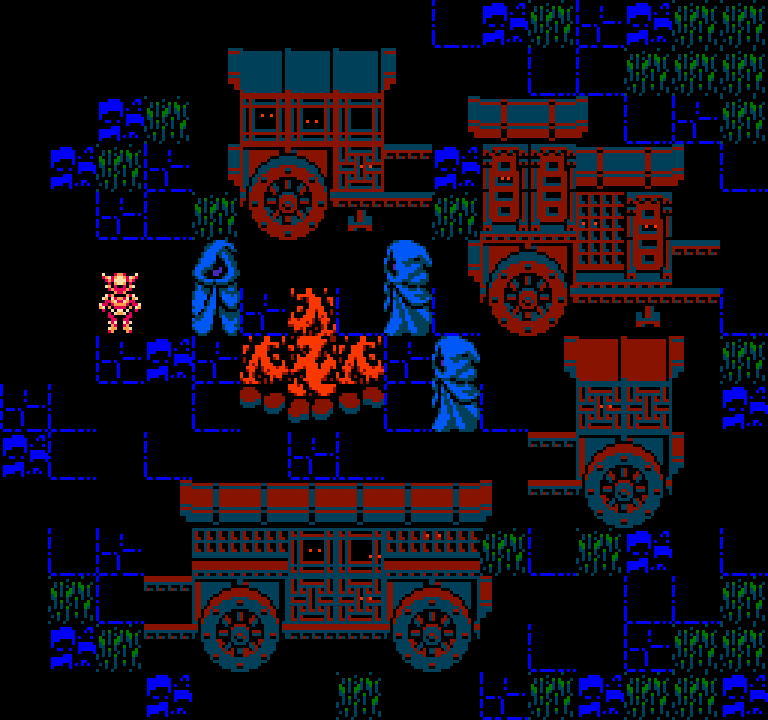 But right now, I'm just sketching out the big set pieces to see how far I can push the world with the tile and pallet limits. Readability is a big concern, but I think that will be easier to work out in production, as appose to tripping over solutions for it now. Still, it's a good note to get, so thank you! Only 2/4 background palettes needed for that last one! The one before it is 3. Cool work. Thank you! Yeah, with the early sketches, I'm trying to save one or two pallets for when I actually need to make this fit the game and narrative. But keeping the background dark and cool lets the bright warm sprites really jump off the screen. 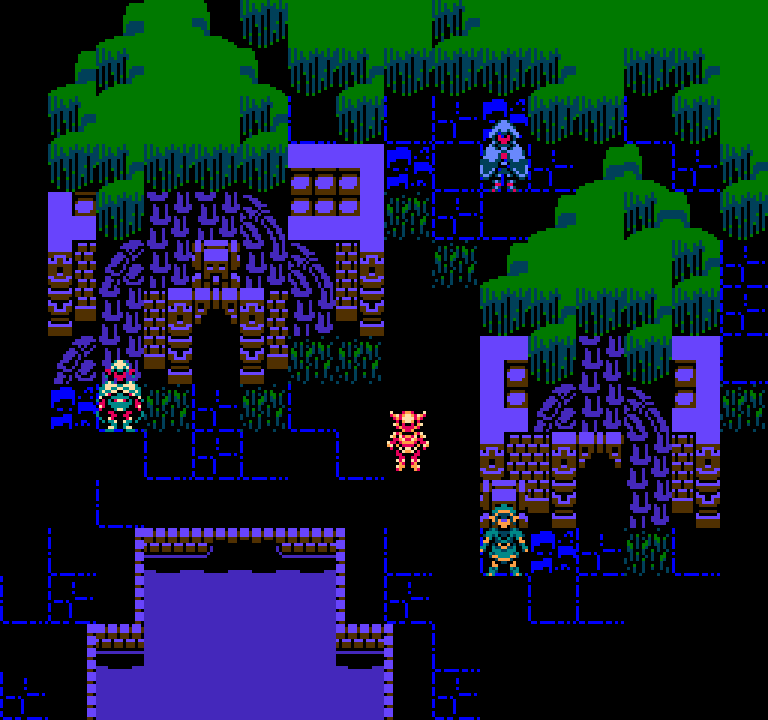 Here are some village type tiles. I have some NPCs overlapping the background tiles. Doesn't look tooooo bad, but it would look way worse when they move, I'm sure. 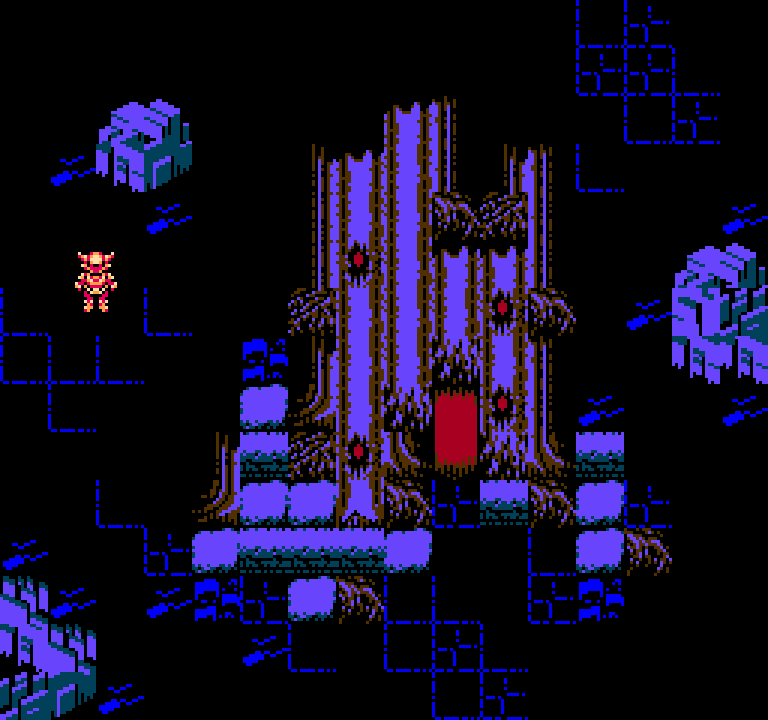 This looks like Hyper Light Drifter for the NES. Amazing! Are you actually turning this into a game?